Ever wonder what Olivas Links would look like after a nuclear attack? Wonder no more. 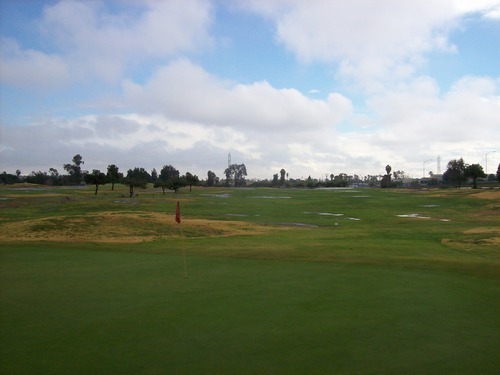 Just visit The Links at Victoria Golf Course in Carson, CA. This course has a reputation for being a nightmare condition-wise, so I couldn’t have been too surprised. But sometimes you have to see it to believe it. 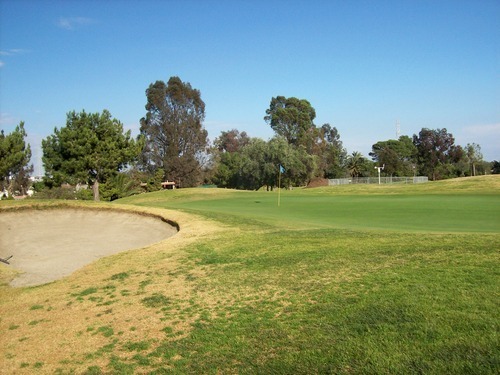 Given that Carson is a very industrial area with it’s massive oil refineries and lots of traffic converging where the 405 and 110 freeways meet, you wouldn’t expect a golf course there to be anything too exciting. In a way, Victoria is a fitting course for the city. 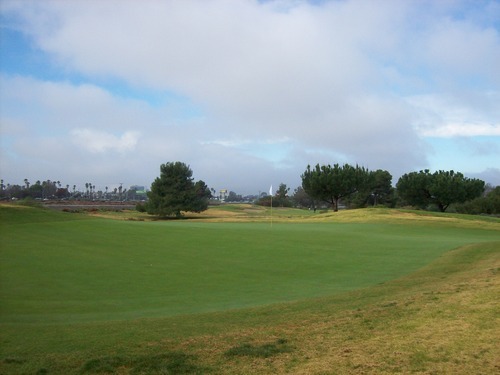 But then again, courses like Industry Hills prove that you can create beautiful courses in the least likely of places. Having read reviews of Victoria on Greenskeeper.org, I knew to temper my expectations going in. 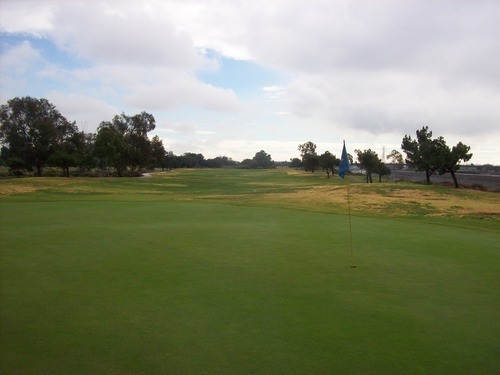 One reviewer nicknamed it “Chernobyl” because the course has a very tough time growing grass consistently. That’s generally not a good trait for a golf course. But as the Golf Nomad, I am willing to play anywhere at least once. Today was the day I could check The Links at Victoria off my list once and for all. Like last week, I was looking for something cheap and convenient. But this week, weather was also a major factor with rain projected most of the morning. Victoria fit the bill with an 11:00 time on ezlinks.com for $30. 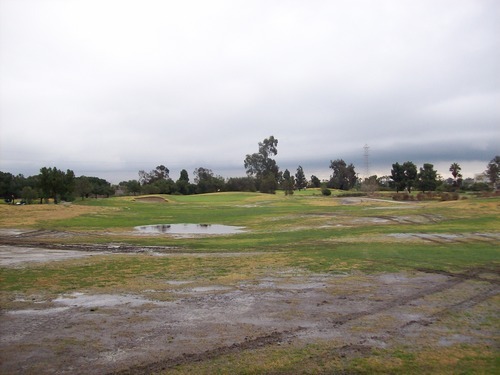 I was hoping that the morning rain would scare away at least some of the normal LA County golf course traffic. 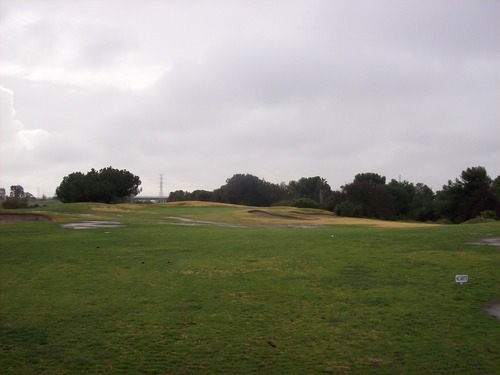 It was still drizzling when I got out to the course, but forecasts called for it to clear up as the day went on. 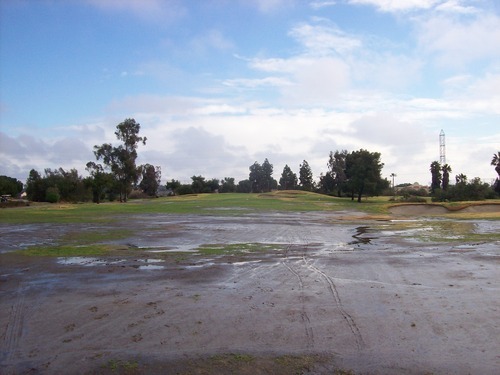 As long as no heavy rains came through, I’d be satisfied with the decision to play. Unfortunately, there were plenty of people there. The guy in the pro shop informed me that they had a tournament group going out and my 11:00 time was the first time out after them. Not the news I really wanted to hear on a gloomy day. I hit a few practice putts and watched all the groups lining up on the first tee. I couldn’t help but notice that the 10th hole, running parallel to the 1st, was wide open. I figured there wouldn’t have been many people going out earlier when it was raining much harder. So I figured it wouldn’t hurt to ask if I could go off on the back nine first by myself. They agreed to let me, so that was a bonus service point in my book! I cruised around the back nine, fighting my way through the sloppy and poor conditions (more on that later). I didn’t run into a group until the last few holes, so it was a much more enjoyable pace. When I circled back around to the front, though, there were plenty of people there. The weather had cleared up a bit and the golfers were all ready to go. Luckily, they let me squeeze in by myself right away. I got out ahead of a few foursomes and behind a twosome, who I figured to join soon enough. However, they didn’t really seem interested in wanting me to play along with them, so I just stayed on my own behind them. There were plenty of groups backed up ahead, so I didn’t push too much. The pace on the front nine was very slow, but I ultimately finished without much trouble. I had low expectations when it came to conditions. Secretly, I thought “maybe it’s not as bad as people make it out to be.” Unfortunately, you kind of have to see Victoria to fully understand the “Chernobyl” comments made by others. It certainly does look like a war zone in the fairways and rough. There are a few patches of grass here and there, but there are also a ton of completely dead areas. Normally, these areas would play as firm hard pan dirt, but today they were playing as mud. I think I would have preferred the hard pan because I would have rather had a lot of extra roll-out rather than muddy balls and soggy stances all day. The unofficial local “rule” at Victoria is if you hit a dead fairway section, you just move the ball to the nearest area of grass and play from there. It’s the only fair way (pun intended) to enjoy this course at all. 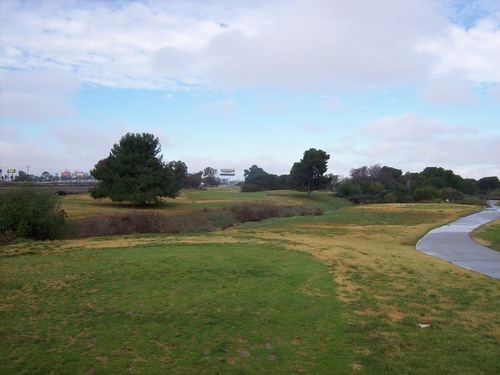 With this being a flat links style course, the lack of any fairway definition sometimes made it hard to aim off the tee. Fortunately, most holes have fairway bunkers well positioned out there to give you some kind of angles. I would like to note there was one hole on the back (the par-5 15th) where the fairway was actually pretty decent all the way from tee to green. It was the exception, though. Some holes were better than others, but most were a mess. One positive thing to note is that the greens here are pretty nicely conditioned. 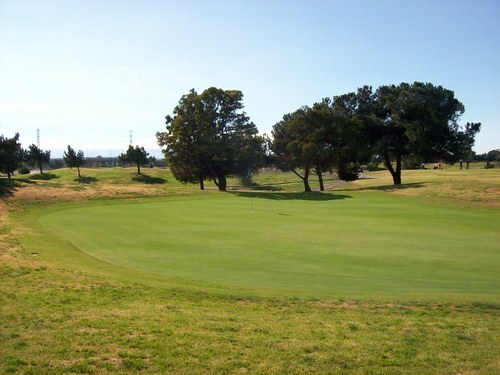 They are the one area the Victoria greenskeepers can seem to get right, and it does help to have good greens to putt on. The bunkers were packed firm because of the dampness, so I couldn’t really get a good gauge on how well those normally play. It’s actually a shame that Victoria is not able to maintain any kind of decent conditions because it’s a pretty decent layout. 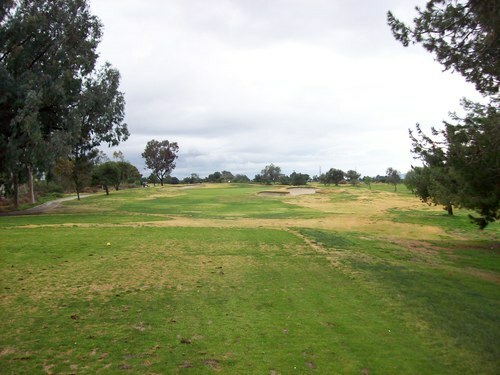 It reminded me a lot of Olivas Links in Ventura. They are both kind of forgiving, yet interesting-enough links style designs. 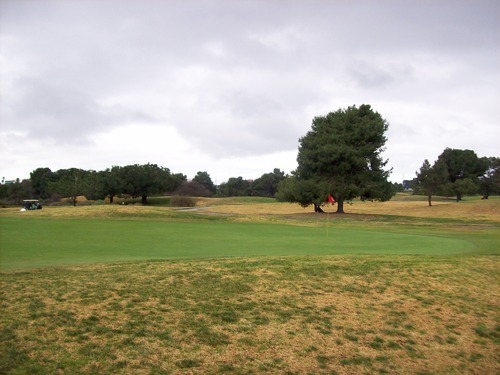 The greens at Olivas feature more undulation than Victoria, where the breaks are much more subtle. They are there, though, and more severe than meets the eye, so you do have to pay attention on putts. 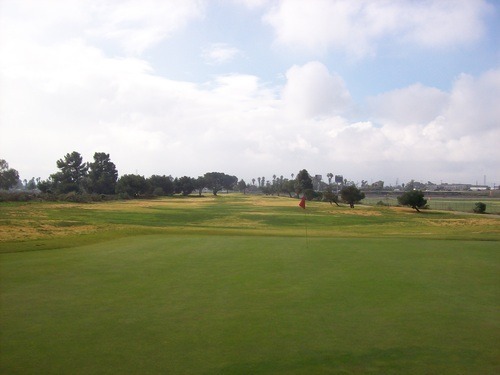 The fact that Victoria is right next to the busy 405 freeway doesn’t really help the “atmosphere” at the course much either, but it would be an enjoyable layout if the conditioning was better. But like Brookside last week, Victoria is a course that still gets plenty of play no matter what. It’s a relatively inexpensive, easy-to-get-to, County-owned course, so it is what is and I wouldn’t ever expect it to be great. Yes, that’s a “fairway” below! 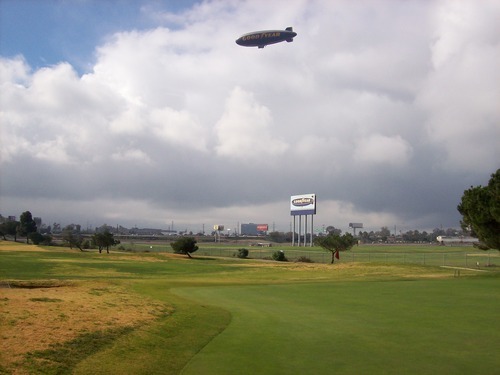 Last but certainly not least, the single most interesting thing about Victoria is that it is located right next door to the landing field that’s home to the world-famous Goodyear Blimp. A few holes on the back nine go right next to it. 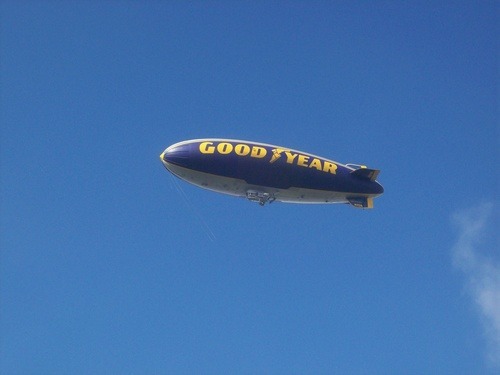 I was sad when I got off the freeway and saw that the blimp was not home. I was hoping I’d at least see it out there, just to add some entertainment value. 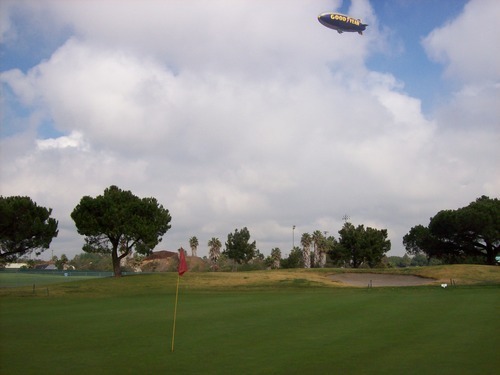 As I was getting set to tee off on the 18th hole, I heard a low hum in the sky above me. I looked up and there she was, getting ready to land. With nobody behind me at that point (remember I played the back nine first by myself) I decided to drive back over to the 16th green, which is right next to the landing field. I figured I would just chill out and watch as the blimp made its descent overhead. I dicked around there for a good half-hour as the the blimp slowly and tediously circled above. It works its way down in altitude bit by bit. After awhile, I realized it would be at least another half-hour by the time it actually got low enough to touch down. So I went back to my game. 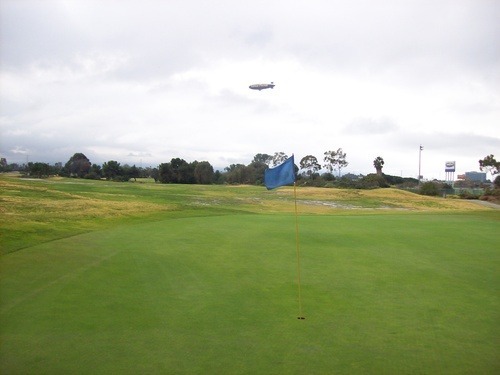 It continued to circle over the course for at least another half hour (going quite low and right over my head a few times on the first couple of holes on the front nine) before it finally landed when I was well out of sight of the landing field. Oh well. It was still the most interesting part of my day out there!